The fast food chain is bringing back a carnival-inspired sweet treat. Next time your taste buds are tingling for a sweet treat and a large fry, Burger King hopes you’ll combine the craving with their newest menu offering: funnel cake fries. If Jenna Dewan's french fry birthday cake was any indication, 2019 promises to be another year of creative culinary combos. The burger giant announced Wednesday that starting Thursday, Jan. 24, customers can indulge in a revamped version of a classic carnival treat. “The fries will have all of the tasty aspects you love about funnel cake: hot, crispy, and topped off with powdered sugar, but in french fry form,” a company representative told TODAY Food. 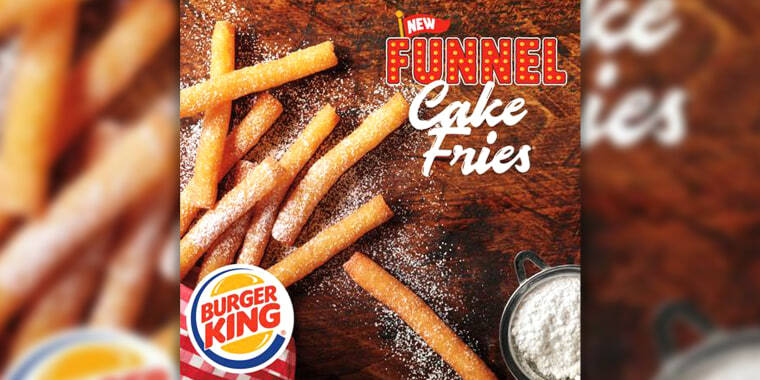 This product launch actually marks the second time funnel cake fries have hit Burger King’s menu. Back in 2009, the chain offered the sweet fritters in nine-fry servings at $1.79 for a few weeks. When the powdered, crispy, golden goodness floated off the menu, a crowd of Twitter users rallied around the treat and begged for its return. Just two weeks ago, another Burger King lover tweeted, "I will never stop thinking about when Burger King had funnel cake sticks." And just like magic, the king heard the cry over social media. Ten years later, the sweet fries are back and cost $1.99 per carton. Burger King's innovation certainly isn't the first (and it won't be the last) fast-food mashup to hit restaurants. Over the summer, Froot Loops teamed up with fast food giants Carl’s Jr. and Hardee’s to create the Froot Loop mini doughnut. Similarly, Krispy Kreme dreamt up some cookie-flavored donuts last April. And back in 2016, Dunkin’ introduced Donut Fries to the world. They were basically deep-fried, sugar-coated doughnut sticks (read: churros) that came in bags of five. The sweet Dunkin’ fries didn’t last long — and neither will Burger King's offer. According to the fast food chain, this dessert fry is only available for a limited time.